At times when humanity is troubled with the insufferable conflicts of the world, people turn to the sky for serenity and inspiration. One would indeed find it soothing to dream about the planets, the stars and the harmony of their existence. Gracefully poised on her ottoman near the courtyard’s water fountain and green foliage, she unfolded her tale.. Looking at our Solar System now and seeing how its planets swirl around the Sun so peacefully, you might think that it has been this perfect from the beginning. You would perhaps be surprised to know that the environment wasn’t so peaceful a few billion years ago! Let me tell you the story of how our solar system and billions of other star systems in our Galaxy formed. Our Galaxy, the Milky Way, is pregnant with countless clouds of gas and dust. A star is born from such cloud. As the cloud collapses, the star gets bigger and bigger but this is not the only condition for the star to be born. The star needs to accrete or accumulate even more stellar matter. To do this, it forms a thin disk around itself and accretes through this disk more gas and dust. This disk is not smooth and perfect as you would imagine, but a rough one with lots of small clumps of various different densities everywhere. These clumps are not all the same size either. The larger ones manage to capture and accumulate the material around them and they become even fatter. Also, it is very possible for two small clumps to crash into each other. When this happens, they either get destroyed altogether or they merge to make a larger clump. As you see, the environment seems quite harsh but it is exactly under such conditions the planets are born! Once a clump gets large enough, a planet forms in the disk, which is why we call the disk a protoplanetary disk. The planet can change the pressure of the gas throughout the disk, and the larger the planet, the more prominent the disturbance it causes. This disturbance in the gas pressure repels all the dust from the planet. This clears the planet’s path from the loitering debris as it orbits its star. The grains of dust that did not make it into a planet are left out. Heart broken by this rejection, they join hands and form a glowing ring of dust around the planet as it proudly struts in its own traffic lane. Recently, astronomers managed to observe these fascinating dust rings in various protoplanetary disks in the Milky Way. A very famous example of a disk featuring very clear dust rings is HL Tauri. They observed it using the Atacama Large Millimetre Array, or ALMA. ALMA is our largest interferometer to date, squatting under the blazing sun of the Atacama desert north of Chile. It is composed of 66 large radio telescopes that work together as one to give incredibly detailed pictures. You might think once a planet forms in one place it will stay there until the end of its life. Or perhaps you might think that planet Earth was born exactly where it is now as it orbits the Sun. However, this is not very clear to astronomers yet! According to a popular theory called “planet migration”, during their formation planets can migrate outwards or inwards under the influence of different forces within the disk. Therefore, it is possible for a planet to start forming somewhere in the disk but then end up somewhere completely different, either closer to or further away from the star. This theory is still under investigation and we are still uncertain if planet migration occurs. Regardless, perhaps this should inspire us humans to be more friendly and accepting of the migration and movement of our fellow Earthlings as part of the natural order of our Universe. Back in the courtyard Scheherazade’s crowd realised that order often emerges from turbulence and conflict. And when they dispersed, their hearts were hopeful that one day things will be more peaceful and serene on their planet just like they are now in the skies. 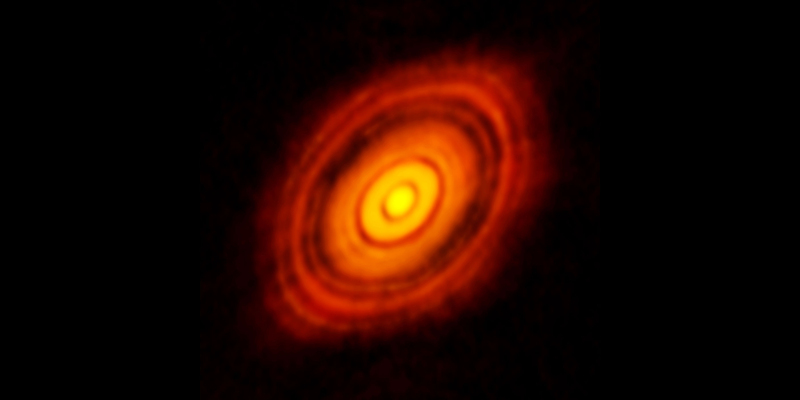 Image: HL Tauri observed by ALMA and the rings of dust in the disk. Pooneh is an Astrophysicist whose journey still feels like a dream to herself. She was born in a small town in Iran, and as a girl she was told by society that her brain can never be as smart as a boy’s. She almost believed it but her love for physics wouldn’t leave her alone. 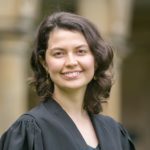 After finishing school in Iran, her parents supported her to start an undergraduate degree in Astrophysics at the University of St Andrews, UK, where she received the Astrophysics Project Prize for her BSc project. That was when she realised that she can be a girl and still do physics! After graduating from St Andrews, she was awarded the prestigious Trinity Sheepshanks Studentship to do her Master of Advanced Study in Astrophysics at Trinity College, University of Cambridge. Now she is about to embark on yet another exciting research adventure for her second Master’s degree at the Institute of Astronomy, University of Cambridge.